Note: as of spring 2011 Robert Battle is to take over as Artistic Director of Alvin Ailey from the retiring Judith Jamison. Taking this into dance creates a visual break which is startling, at least to our normal expectations for dance concerts. You can see some of this in Hip Hop moves, sudden breaks, seemingly erratic directions. Robert Battle started with martial arts and he brings that sensibility to dance. His dance students do the traditional dojo thank you to the sensei (SEN-say = teacher) at the end of the class. 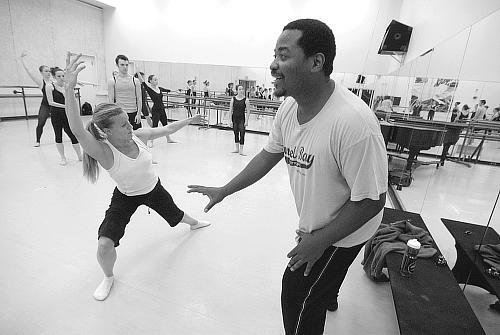 Robert Battle (right) and dancer/rehearsal director Erika Pujic (left, front) demonstrating a point in studio to the class. For the week before the Battleworks concert Robert Battle and rehearsal director / dancer Erika Pujic worked with UMKC dance students as they set his work "Battlefield" on them for the UMKC Fall Dance Concert (7 November 2008). At the end of every class students thanked their sensei as they would in a dojo. The lineup after audition for "Battlefield" pointed up something about the level of freshmen entering the dance program at UMKC. Overall, more strength and depth for incoming dancers. UMKC has been a good school for dance over the years, although it was more in line with a few really strong dancers with the rest trailing a bit. Over the last several years the level of all the incoming dancers has been shooting up. For "Battlefield" somewhere around a quarter of the dancers chosen are frosh. I hadn't really noticed it until looking around at the first rehearsal I realized how many of the dancers are new to the school. I hadn't seen them before. This is really a tribute to both dance schools around the area which feed the university departments but also to the UMKC dance program itself which finds that it is able to attract these good dancers. 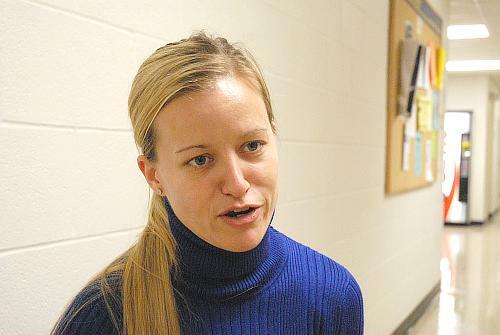 A further marker of quality for the UMKC dance program was the quickness of the UMKC dancers in learning "Battlefield." This is both a tribute to the expertise and ability of Battleworks dancer and rehearsal director Erika Pujic and the dancers themselves. Erika had to introduce entirely new types of movements to these dancers. It isn't easy to make that kind of adjustment. I watched Erika show, demo, cajole and praise, and always very evenly, mixing techniques they already know while introducing new wasy of moving into the edges. A look at this picture from the first rehearsal (day after audition) shows just how good these kids are (not really kids, that says more about my age than theirs) and how well Erika was able to work with them. The dancers are frozen here in a Pollack-like frenzied swarm cloud. As they keep turning they move across and through each other into position to form a large, evenly-spaced circle. In this shot everyone seems turned in a slightly different direction. A further look, checking each dancer in turn, shows the precision of the formation. Feet and legs are matched regardless of which direction each person is turned. Left foot down with a light relevé. Right foot up. All have almost exactly the same amount of down and up. Remember, we are looking at a couple of hours into the first rehearsal. This concert put into focus (pun not intended) my search for the next generation of video equipment for me. A camera viewfinder is not really the best way to see the concert, but it is the way I see most of them. I shot stills during tech rehearsal (there was no dress) and video for the performance. This changed my usual way of shooting. Especially the rapid strike, no-prep type of movements. Both in stills, where (1) the trigger rhythm has to change and (2) single photos don't work as well as short sequences. In video I realized 30 frames per second may not be sufficient to really to this justice which takes us back to stills. It may seem ironic, but appreciating what takes place in that fast motion may be done better in still photos, in particular short sequences of still photos. Otherwise the the fast movements are so fast that the detail is not seen. This concert took me back to information about martial artist Bruce Lee who was too fast to be recorded on film at film's sound speed of 24 frames per second. Often Lee was shot at 32 frames per second. That is, one-third more frames were shot per second so that when they were played back at 24 fps Lee's actions appeared slower by 25-percent, down to three-quarter speed. Even then Lee was a blur. But at 24 frames per second his movement was simply missed. The standard 30 frames per second (actually 29.97 fps) is closer to the 32 frame rate. Still, it may not be the best rate to do justice to Battleworks. Proposed 60 frames-per-second rates of record and playback will do a better job. I am in the process of determining what I need to aquire for my next round of video equipment. New items are coming out now with more promised over the next few months and Battleworks gives me additional considerations when making my dream lists. HiDef is clearly required to go into the next few years. True wide-angle lens, not just wide field format is imperative. Non-tape work flow high desirable. I need a compresion method without motion artifacts meaning that a promising AVCHD camcorder from Panasonic may not yet be right. And one which works in very low light. I am almost always shooting in dark spots, very seldom in good lighting. Most reviewers seem to shoot only occasionally in dark places so they seldom talk to me directly. Then the other considerations: CCD/CMOS. 1/2-inch or 1/3-inch. Movie-like DOF or more depth in focus. Then comes the need to look at what I can do with frame rates. Non-tape media storage generally gives me options for more frames per second though not always playback at the same rate. I should note that I am finally beginning to see some people write openly about what I have thought for some time, that trying to make video have that "movie-look" using 24-frames-per-second progressive scan is ridiculous. Film should die. Video is the new king. It finally has a useful resolution. All video should be progressive scan. Interlaced scan was a fix for a technical limitation in the late 40's. We can do better now. 24-fps is a technical and financial limitation of film. 24 frames a second was the slowest frame rate for sound where the sound and photo both were acceptable. Financially a higher frame rate is just too expensive. Compared to video, film is tens to thousands of times as expensive. 24-fps is so slow that you have to be careful to keep zooms, pans and dollies slow otherwise the film blurs. There are rules about this. It is a limitation, not a "look." It is time we used HiDef video, preferably at 60 fps and progressive scan. So, to do justice to Battleworks as well as to do the rest of what I want I need to look at (affordable to me) cameras which will do HiDef at a native resolution of 1920x1080 (HDV records at 1440x1080 expanded to 1920x1080 on playback), up to 60p frame rate with a truly wide-angle lens, CMOS sensor and 1-3 to 1/2 inch, at 4:2:2. Then again, I am watching Red Scarlet. And if that isn't enough to change the landscape Canon is bringing out its newest D5 full-frame DSLR, the Mark II ($2700 for the body) which will has HD 1920x1080. UMKC dancers are doing Battle in the studios. It is not a mutiny, but rather an intense dance residency with innovative dance choreographer, Robert Battle, to expand dance students' experiences, and thus, their horizons. "It is a very different technique for thinking about moving," said Erik Sobbe, a junior in the Dance Program. "You have to be really alert.... the movements are so abrupt and unexpected... with lots of jumps and falls... which can be very unforgiving if done wrong... you have to be very careful, so as not to be injured... which is all part of the learning process"
A residency allows a choreographer to be brought in from the professional dance world to work with students over the period of several days or a week, almost in seminar style, in order to give students more professional dance exposure. "It gives us a safe environment to try things out," said graduating senior, Ann Taylor. "It gives us a chance to try learning new movements, and see what else is out there related to different dance styles." 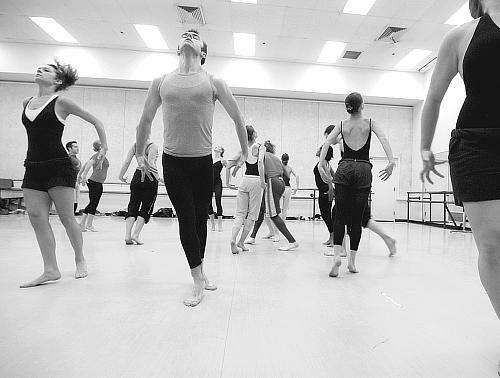 Many of the choreographers that the Conservatory has brought in for residencies have been of some professional stature such as Don McKayle or Mino Nicoles, and often in conjunction and collaboration with established professional dance companies, such as the Kansas City Ballet or Wylliams/Henry Danse Theatre. "The purpose of a residency is to give students an opportunity to really work with master choreographers... using a dance technique that is different than what they usually do here," said Mary Pat Henry, Dean of Faculty Affairs and Professor of Dance. "A residency should push them to another level, challenge them, pull them stylistically... to be able to achieve the choreography the way it is set." The Dance Division saw an opportunity for bringing in a newer choreographer when the Conservatory Signature Series invited the BattleWorks Dance Company, a provocative contemporary dance group based in New York City, and founded by Robert Battle. "We talked to the Conservatory about the possibility of his doing a residency... both with the students, and with the Wylliams/Henry Danse Theatre company," said Henry, referring to the dance company she co-founded with the late Leni Wylliams, and which enjoys Artist-in-Residence status at the Conservatory. "Fortunately, it all came together." Once the arrangements were made, Robert Battle came with his Rehearsal Director, Erika Pujic, to teach a series of master classes at different levels, so as to include as many students as possible into the experience. Pujic and Battle met when they were both students at Julliard, and Battle's first piece of choreography was set upon Pujic, so they have had a long working relationship. "We do the master classes together," said Erika Pujic. "Then I rehearse with the students, while Robert works with the Wylliams/Henry dancers." It is interesting to note that Robert Battle was a protégé of David Parsons, a well-known choreographer who is a Kansas City native. Battle feels that there is a sense of universal symmetry balance by being asked to teach in Kansas City. "It seems like things have come full-circle by coming here to teach, since David Parsons was from Kansas City," said Robert Battle. "It was working with the Parsons Dance Company that gave me my first experiences working with students in a residence teaching relationship." Battle learned to love dance and the arts early, from his mother and her theatrical performing group, to their mutual love of Fred Astaire and Baryshnikov films, to the popularity of Michael Jackson videos. He knew at an early age that he wanted to be a dancer. Along with the love of dance, came the love of teaching. "Although Parsons gave me my early opportunities for professional recognition for performance, choreography, and teaching residences, I already had a love for dance and for the teaching of dance," said Battle. "I have always loved the teaching process... the process of distilling information and passing it along.... it makes me feel connected to a whole dance legacy." The residencies are very important experiences for dance students, not only for learning new moves, but for their future dance careers. Residencies create unique opportunities to make professional connections for the future. "The dance residency helps students in two ways," said Mary Pat Henry. "First, it helps them build up a repertoire of movement and pieces.... Second, it serves as an introduction for the dancer, to a professional working in the field... thus, giving the dancer a chance to network with professionals in the dance world."